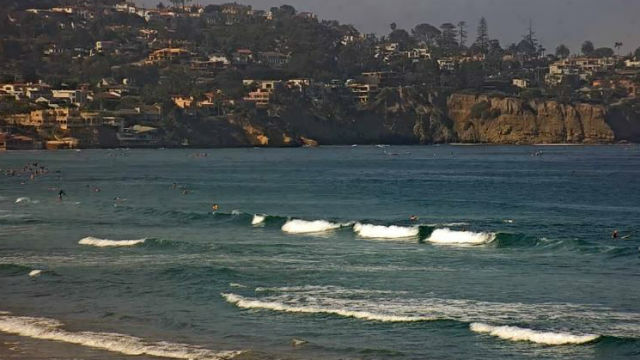 San Diego will continue to bake under a heat wave Thursday while increasingly high surf from Hurricane John could cause potentially dangerous beach conditions. The National Weather Service office in San Diego issued an excessive heat warning in the valleys and coastal areas that lasts until 8 p.m.
High temperatures Thursday are expected to range from 101 to 104 degrees in Escondido and El Cajon, while Vista was expected to see temperatures as hot as 95 degrees. Coastal areas will be slightly cooler, with highs expected near 94 degrees. High surf from Hurricane John, currently more than 300 miles west of the southern tip of Baja California, prompted the weather service to issue a beach hazards advisory that begins Thursday at 6 p.m. and ends at 11 p.m. Saturday. Surf levels of 3-6 feet and evening high tides around 7 feet could cause minor coastal flooding through Saturday, forecasters said. Monsoonal moisture in the region also brings a chance of scattered thunderstorms in the county mountains and deserts through Friday. The monsoonal moisture is expected to decrease and temperatures are expected to drop to slightly above average for the weekend, forecasters said.